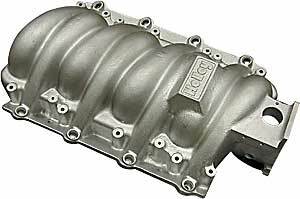 Weiand and John Lingenfelter collaborated to develop this killer aluminum intake manifold for serious LS1 horsepower. It's the perfect manifold for big motor combinations and forced induction applications. The removable bottom plate allows access to the internal passages. The cast aluminum design is more durable than the factory composite. ''Boost'' or ''spray,'' this manifold can handle the added stress of forced induction and nitrous injection. It contains extra material for flow modifications (hand, CNC, or Extrude Hone) to feed hungry modified LS1 engines. The aluminum manifold's thicker walls can also be machined for NOS fogger nozzles or other modifications. Does Weiand 300-111 fit your vehicle? Can you bolt bigger throttle bodies to this intake over stock ls1? If so what sizes fit? This is designed for the stock throttle body, but can be changed within 10 mm of the original diameter.